Researches: Sergio Lavandero, Mario Chiong, Zully Pedroso. The main function of support in animal experimentation unit is to provide researchers of ACCDiS instruments to bring an animal facilities and the necessary instrumentation to carry out experiments in animal models, related to cancer and cardiovascular diseases, in accordance with the highest ethical and scientific principles. to) A vivarium: This area has area dedicated for normal and transgenic mice. b) Procedures room: This room offers a fully equipped operating room for small animals (mice and rats). c) A team of ultrasound multipurpose which serves for examination of the heart and other organs (available in the procedure room). d) Procedures room, ex vivo: the Center has a procedure room, make ex vivo experimentation to slaughtered animals. Within this space are expected to install a heart perfused Langendorff, fully equipped and a bathroom termoregulado for trials of aortic rings. e) Veterinary care: This facility has veterinary staff in charge of the administrative functions and care. Researches: Alejandro Corvalan and Lissette Leyton. Encoding and expression not coding provide an excellent system for the discovery of biomarkers in cardiovascular diseases and cancer. This facility will provide an analysis in silico and profiles for database services (ieTCGA, GEO, CGHub) and genes, set custom or off-the-shelf existing prefabricated panels, along with profiles in a wide collection of more of 700 people, as well as miRNAs murine derived from miRBase for six groups of ACCDiS research. The laboratory analysis will begin with biological samples provided by researchers, to produce coding and not codification of expression data along with data quality control. These data will be available through accounts protected by password accessible through this web site. 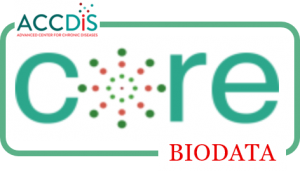 Bioinformatics and Biostatistics support will also be available on-site to educate researchers about approaches and tools for ‘omics’ data analysis. Will be offered assistance with concepts and programs related to image analysis, statistical methods, Clustering, monitoring learning and other aspects of data analysis.